Belly Bugs Gummy Candy. These are so cool the kids just love getting these fun treats. 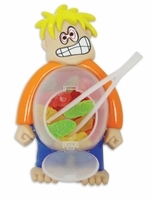 You get a plastic guy with his belly filled with gummi candy in the shape of bugs. Included is a plastic tweezers so can help him get rid of his tummy ache by removing these bugs. These remind me of the old time operation game . As kids we had hours and hours of fun playing.